Entries must be original and unpublished elsewhere. No simultaneous submissions and no previously published (or accepted for publication) submissions. This means that an entry must not be under consideration elsewhere for publication or broadcast, nor accepted elsewhere for publication or broadcast, nor entered in any other contest. Work that has appeared on the internet (e.g., online magazines, blogs, or social media sites) is considered published and is ineligible. Judging for the contest is blind. Do not identify yourself on your actual submission. Include a separate cover page that has on it the entry’s title(s), the category your entry goes in (short fiction or poetry), and your name and contact information (mailing address, phone number, and, if you have one, your email address). All entries must be submitted by mail and postmarked by 1 December (or the next business day when the 1st falls on a weekend). No faxed, digital, or emailed submissions are allowed. Word-processed or typed entries only. Please use white paper, print only on one side; 12-point fonts preferred. Clip the sheets together, do not staple. Please keep a copy of your entry; entries will not be returned even if accompanied by a SASE. One short-fiction submission is one story (6,000 words maximum). Short-fiction entries should be double spaced and paginated. The word count should be noted on the cover page. One poetry submission is up to 3 poems; no more than 100 lines per poem. The title and the number of lines for each poem should be noted on the cover page. Poems may be single spaced. If a poem is longer than one page, please make sure that each page is numbered and has the poem’s title on it. An entry consists of one submission in one genre (either short fiction or poetry but not both). If you, for example, send 1 poem and a story, then you have sent two entries – one for the poetry category and one for the short fiction category — and you must include payment for two entries. Entry Fee: $30 for an entry from Canada and $36 for an entry from elsewhere in the world. The entry fee includes a one-year subscription to The Fiddlehead. You will receive a one-year subscription to The Fiddleheadeach time you enter the contest. Already a subscriber? — you'll receive a one-year extension to your current subscription or you can choose to gift a friend by using the Gift Subscription Form. Multiple entries are allowed; however, each entry must be accompanied by its own cover page and entry fee. Each entry is good for a one-year subscription. If, for example, you send two entries and are from Canada, you will send two cover pages (one for each of your two entries) and an entry fee payment of $60, and you will receive a two-year subscription (or a one year subscription for yourself and a one-year gift subscription for a friend). Paying by cheque or money order? Make your cheque or money order payable to The Fiddlehead and enclose it with your entry. International entries paying by cheque or money order must pay in US dollars. Paying by credit card? Download and print out the Contest Credit Card Form and enclose it with their entries. International entries done by credit card will be charged in Canadian dollars. We are sorry but debit and bank access (ATM) cards cannot be used in place of credit cards. Want to give your contest subscription as a gift to someone? Entrants wishing to give their subscription as a gift must download and print out the Gift Subscription Form and enclose it with their entries. Contest winners and honourable mentions will be contacted directly (by either email or telephone) before the end of February 2018. Other entrants are not directly contacted about the results. Authors’ names and the titles of the works that made the longlist of 15 in both categories will appear on The Fiddlehead’s website in early March 2018. A shortlist of approximately 6 will appear in early April 2018. 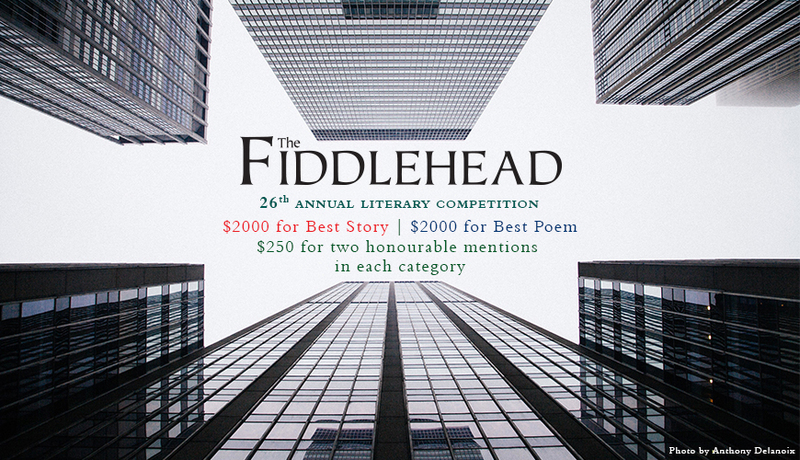 The winners and honourable mentions are announced on The Fiddlehead website and on The Fiddlehead’s social media spaces once the spring issue comes out. The winning entries and honourable mentions are published in The Fiddlehead’s spring 2018 issue and on our website.Authors are paid for publication in addition to their contest prizes. The two winners will be interviewed. The interviews will be published on The Fiddlehead’s website when the spring issue comes out. The Fiddlehead occasionally swaps its subscription list with other literary organizations. If you don't wish to be included in such exchanges, please state this on your entry's cover page. An entry will be disqualified (no matter at what stage in the contest process it is at), if it is discovered that an entry has violated the contest rule on simultaneous submissions, prior publication or original authorship. The entry fee will not be reimbursed; however, the entrant will still receive the one-year subscription.